The first year I taught a college class as a full time university employee in 2005, I made a rigid, stern, bordering on mean syllabus full of classroom do’s and don’ts (mostly don’ts). I thought I needed a harsh syllabus to assert my authority as a 20s-something professor. But, I didn’t want to come off as the one-dimensional cartoonish “evil” professor either so I would throw in a few attempts at humor as well. 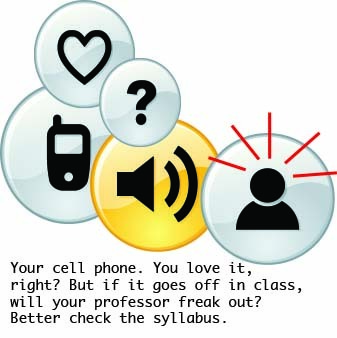 Here’s an example of my cell phone policy from a class in 2005. No cell phones or other electronic devices may be used in class. I’m a cell phone junkie and understand the addiction, but please turn all phones to silent and do not answer them, send text messages or play games on them in class. Texting in class is the surest way to make me angry—don’t test me on this. If it gets to be a problem, I will ask you to leave the classroom. For some reason, I look at this and it makes me want to pat my 2005-self on the head like an adorable child. Cell phones ringing in class was the surest way to make me angry back then. It did send a shot of hot annoyance to my core and made me feel like the student was purposefully disrespecting me. Love it or hate it, our smart devices are extensions of ourselves now. My iPhone 5 is my calendar, my alarm clock, my notepad, my camera, my dictionary . . . oh yeah, and my phone. Some of those uses are quite acceptable or even necessary in a work environment. No one seems to notice anymore if I pick up my phone during a meeting to enter in the next meeting date to my calendar. No one appears to be offended if I use a smart device in an appropriate way during work activities. Can phones and other electronic devices still be a nuisance in the classroom? Of course! And I don’t recommend that students start leaving their ringers on or send lengthy texts when they should be taking notes, but if a student can send a one-word text and still manage to keep up with the note taking, I’m no longer going to be offended by it. If someone’s phone dings in class, and they apologetically turn the sound off, I no longer seethe. I shrug it off, and I’ve been doing that for years now. So, the rigid cell phone policy is simply no longer needed in my syllabuses. Personal Electronics: Do not allow your cell phones and other devices to become a distraction. Being a media course, there will be times when electronic devices will be helpful, even necessary in our class (I mean, we are giving you iPads! ), but do not use them for non class activities during class time. You may use a laptop or tablet to take notes, but there may be times I ask you to close it. Do not use our class time for other class work, emails or to text message. If your personal use of electronics becomes a problem, you can be promptly dropped from the course. Additionally, if you are caught using your cell phone or any other such device during a quiz or exam, you will be considered in violation of the university’s policy on academic dishonesty. Put all personal electronic devices on silent or vibrate before you enter the classroom. If you forget and it goes off in class, silence it immediately. If you must take an emergency call, step outside the classroom completely to talk. This new policy offers a more realistic, honest arrangement between the students and how I really feel about our electronic devices. Society changed, and my syllabus followed. However, I need to warn my students they should still be respectful of other professors’ differing policies. If I taught in another department, I’m not sure I would feel lax about electronic devices in class. But the major point is, part of college is learning how to deal with a variety of personalities, and each professor is going to have a unique perspective on classroom policies. So for now in my class, if I notice your cell phone light up, it will probably barely register with me. But if you answer it casually while sitting in your seat as I lecture and especially if you proceed with a conversation (this happened to me a few years ago! ), I’ll probably still ask you to get the hell out of my class. Tagged cell phones, education, gaylord college, professor, university of oklahoma. From my visual communication class syllabus this semester: This is a media literacy course, so we are taking the position that learning to use media devices to better your own life, including your own education, is an important skill. Therefore, electronic devices are allowed in class. However it’s up to you to use them wisely. We recommend you use them to take notes, get a better look at visual examples, and find information for your team activities. Powerpoints for each class lecture will be released on Moodle the day before class in order to help you work with your devices well in class. It also means being respectful of those around you. Don’t take calls in class. Turn off all ringers, buzzers, and notification sounds. If your electronic devices are causing a disruption for others, you will be asked to leave the class. This policy is subject to change if it’s decided that it is harming rather than helping the learning environment in class. I really like the last line of your statement, Sarah. If the policy isn’t going well, you can reevaluate. This is helpful going from semester to semester as each group of students can vary wildly.